Bloodbath and Beyond reviews the movie Campfire Tales starring Jay R. Ferguson, Christine Taylor, Christopher Masterson, James Marsden, and Amy Smart. A group of teenagers entertain themselves by telling an anthology of famous urban legends with a modern twist; including make-out-point, monsters, psychopaths, and ghosts. Oh man, I totally forgot about this movie! Bringing back some memories here. Wish this would get a bluray release, I can’t swing $50 for a dvd. 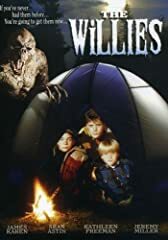 all you have to do is google campfire tales 1997 123movies and its there to watch for free! I would recommend you watch Grim Prairie Tales, an anthology movie with a wrap around story with James Earl Jones and Brad Dourif set in the old west. love it. love you guys. I can’t believe how many people haven’t came across this movie. I randomly watched it on HBO around 2000, and thought it was a great little movie. I’m not saying the movie (itself) was great, just saying the ‘surprise’ was. this is one of the first horror movie I remember seeing. I was around 6, I think. Always love your reviews and will you review Hostel Movies? That’s one thing I don’t like about some horror movies is when they don’t show the kill. If you some good practical effects, then you have some good on screen kills too. What the…a BBB commentary track on the Jack Frost Blu Ray? Get outta here! I absolutely love this movie.. I first saw it I think on HBO when I was maybe 15 (I’m 35 now).. Actually bought it on DVD 6 years ago. The stories were creepy and the twist ending was great..
Deek is like the unofficial third member of BBB at this point. Yall got the best horror movie review channel.